Southern blotting: The Southern blot is used to detect the presence of a particular DNA fragment in a sample.The technique was developed by E.M. Southern in 1975. 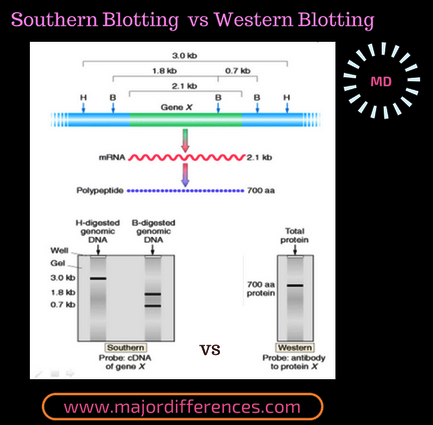 Western Blotting: Technique for detecting specific proteins separated by electrophoresis by use of labelled antibodies. The technique was developed by Towbin et al in 1979. DNA is denatured with an alkaline solution such as NaOH before blotting. This causes the double stranded to become single-stranded. Common labeling methods include radio labeling or fluorescent labeling or use of chromogenic dyes. Common labeling methods include horseradish peroxidase-anti-Ig conjugate or formation of a diaminobenzidine (DAB) precipitate (chromogenic dye), radiolabelling or use of fluorescently labelled secondary antibody.